Leadership training seminar (video short-clips) provide perfect tools to kick off a meeting or presentation - and makes you look like an superstar. If you're a leader and you have a team of people to educate and train (or if you aspire to be), then you'll want to bookmark this page. 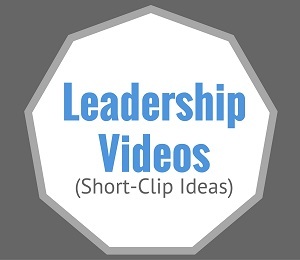 Unlike our page on leadership programs, this page is focused on highlighting short clip videos that will perfectly tee-up a discussion or activity on the leadership topic of your choice. We encourage leaders to create or adopt systems and tools that continually feed your heart and mind with quality leadership training lessons, which offer new ideas and best practices for improving your leadership skills. As the world has evolved to being more digital, you have an amazing library of leadership resources at your fingertips - many that will be introduced to you on this page. You are invited to follow along - we think you'll be inspired by the leadership training seminar ideas that are shared here. By the end of this page, your creative juices will be flowing. As you continue, be thinking about how you might use some of these simple tools and ideas to turn your next team meeting into something powerful, inspiring, memorable or just plain fun. How can I use this video to add value to my team? How can the message of the video be applied within my workplace? What kind of team activity could I create that would be a great follow up to the video? How can I leverage a leadership training seminar or video like this one to help development my team? Don't worry, there are no right or wrong answers. Just be open-minded - try to get creative and identify how you might use this tool to liven up your next team meeting and add value to others. Wait! Did you watch the above video? You did? Okay, then let's continue. It's a sad fact that many leaders do not take the time to research and fully prepare to maximize the impact of their next team meeting. Sure, they create an agenda; invite their business partners and perhaps a key vendor or two to speak for 30-45 minutes each - but how often do participants walk away truly inspired and motivated? Answer: Not as often as they could be. To be successful individually, and as a team, we need to get over things not "being fair", and get on with figuring out what needs to happen next in order for us to meet our goals. Whatever our complaints are, let's get the issues out on the table, talk about them openly - then agree that once we've had our say and determine what we can or cannot change, we'll move forward and remain focused on what we can control. It's important to be thankful for what we do have. Let's identify what's working well and generate ideas on how we can use those positives to help our customers get more of what they need, which will help us to receive more of what we desire. Recognize that how we see ourselves, will determine how others view us. What can we do to better manage perception within our industry or the marketplace? Do you see how you can use one short video clip to be the catalyst for some powerful discussion? It's amazing how much credibility a leader can earn in the eyes of their team members, when it's clear that you've thoughtfully prepared for the purpose of adding value to their day. Hey, that's just one example! 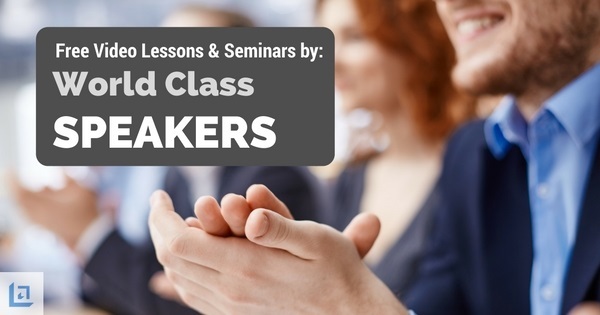 Let's look at several more leadership training seminar clips that can re-purposed for powerful leadership lessons. Never show a leadership training seminar to your team without having fully viewed the entire video. Recognize that some people in your audience could be offended by the slightest bit of profanity, questionable humor, or other related content. Fully screen your video or don't share it. Many YouTube videos contain a pop-up ad. Know when the ad will occur and be ready to quickly close the ad as soon as it pops up as to minimize any distraction. Recognize that sometimes the video itself might contain some promotional message. For example, the speaker might mention his brand new book that's coming out. If the lesson is good enough, then don't get hung up on the fact the person mentions his/her book. Usually the sell comes at the end, so just stop the video to save your people from the sales pitch if you can. "None of us is as smart as all of us. Some of my best thinking has been done by others." Adding a little multi-media to your meetings is always a good idea to break up the monotony of listening to one speaker after another. Plus, it allows you to invite World-Class speakers into your workplace, and introduce them to your team. What a gift! Think about it... if you don't introduce your people to these valuable resources, who will? Wouldn't you rather them know all the great secrets to success while they are working for you rather than someone else? We recommend showing one well selected leadership training seminar or short video that helps to introduce and support a key message that your team is facing. Georgia Tech Sophmore Nick Selby is the perfect example of someone taking some initiative and making the most of their opportunity. The video of his speech went viral and Nick found himself being interviewed by national news channels. How did Nick take something so standard, (giving a welcome speech to incoming freshman) and create something those students will never forget - and millions online would enjoy? Nick brought passion to the stage. Ask this question after the video: So, what is our Iron-Man suit? We've all heard the term "paralysis from analysis", which is just another way of making the point that you need to stop thinking about what needs done, and just do it! This video is short and entertaining - poking fun at how some people tend to miss the obvious solution to a simple problem. Do you have someone on your team who is getting in the way of their own success due to preconceived ideas, or by not being comfortable in looking outside the box? Is your team feeling stuck - or do you have someone who is just along for the ride? Do you see how you can use a simple little video to support some very important leadership messages? Zig Ziglar was an American treasure. Although he's passed on, he left us with countless leadership lessons. One of his most famous is his story about "Priming The Pump". Messages of persistence and, "you've gotta learn to give in order to get", come through loud and clear. This story pertains to living a quality life, not to mention it provides universal lessons for anyone in sales. And if you like this video, be sure to check out other Zig titles. Another favorite is how to make sure you don't get Cooked In The Squat. We also recommend Zig's lesson on How To Evaluate Yourself. Check it out! John C. Maxwell is one of the most prominent speakers on the subject of leadership in the world today... and for good reason. In fact, one of our favorite leadership books is The 21 Irrefutable Laws of Leadership.. the book is fantastic. In fact, you could use one lesson every other week and have enough quality material for a year. You can access full leadership training seminar videos, many are full versions over 1 hour. Maxwell has written many other books such as The Difference Maker, which talks a great deal about the importance of attitude - how it can help you, and how it can keep you from achieving your goals. What the heck is employee engagement? Do you have some employees that are very engaged while others not so much? If so, what are you doing about it? Have you established clear expectations as the leader so that your team knows what you expect in terms of engagement? This 4 minute video shines a light on the subject of employee engagement. Learn what employees must do - and more importantly, discover what your role is as their leader. Who are the "paddlers", the "passengers", and who's only working to "sink the boat"? Don't Ever, Ever Ring The Bell! Our friends at Values.com have created a treasure trove of inspiring commercials that a leader could easily use to support important messages for a more positive and productive workplace. While there are multiple short commercial videos to choose from, let's take a look at three specific examples. In each of the above scenarios, the respective video below could be shown to staff prior to you leading a discussion on the topic. What a great way to spice up your next leadership training seminar or staff meeting. Use these types of short video clips to get all your people on the same page - preparing them to actively participate in the discussion. Watch these short commercials, get creative, keep it simple and have some fun with it. Great leaders understand the importance of regularly seeking out new tools and resources that will energize their team - tools that drive you to demonstrate traits of a seasoned leader; someone who stays at the top of their game. Leadership training seminar and short video clips can be just the ticket to help drive home your message. Unfortunately, most leaders settle on what they currently know or what they were taught early in their career. They complain that there is never enough time to do what they know they should be doing in order to improve their own skills or those of their staff. Don't allow these sorts of excuses to keep you from achieving your goals. Take just a few extra minutes to make your next meeting memorable. Search for a quality leadership training seminar, audio book or other leadership tool that will help to support and add meaning to your message. After showing your first video, maybe you can save time by making a challenge to your team to come up with the next leadership training seminar or video clip to show at the next meeting. Give them a chance to be the leader at your next meeting. Learn from world-class leaders to continually develop your leadership skills and those of your employees. Your team will recognize your efforts and model your example someday when they are sharing leadership training seminar clips to their own team. By the way, when you find a great video clip and use it successfully with your team, we'd love to hear about it. Please share your ideas here.